Whether you’re a business owner trying to protect some of your company’s most valuable resources or simply looking for a little extra security for your home, it’s important to understand the value of a good locksmith. Many people only give consideration to lock and key services when they’re locked outside or if they need to have their locks changed. The reality, however, is that your locksmith provides far more than just occasional emergency services; they’re also responsible for the security of your home or business. With that at stake, having access to a good locksmith is at least as important as having the number for a good plumber, electrician, or auto mechanic. It’s not as simple as summoning the first locksmith that your internet search turns up; you need to search carefully for a well-rounded key and lock company that can do a vast array of jobs. Many people only think about contacting their locksmith when they’re locked out of their homes. And while being stuck outside on a freezing-cold night can certainly have you wishing and hoping you’ve contacted a good—and fast—locksmith, there’s a lot more to the residential services offered by a good complete lock and key service. For example, did you know that the locks in your home need to be regularly maintained? Just as with any other mechanical system, it’s a good idea to have your locks checked regularly to ensure they’re still structurally sound; repairs and replacements will occasionally need to be made. Chances are, you also have plenty of other locks in your home beside the one on the front door. For example, locks on garage man doors, antique cabinets, desk drawers, and safes and vaults. A good key and lock service can help you with the maintenance, rekeying, and other requirements of any of these locks. If you find the right locksmith, they can even help you with old, antique locks. You might want to access your 100-year-old cabinet without damaging it, and a good key and lock service can help you do just that. Of course, if you’re running a business, your lock and key requirements will likely be completely different—and probably more complex—than a simple residential locksmith can provide. Regardless of what type of business you’re trying to protect—be it a bank, restaurant, laboratory, or anything in between—you’ll want a skilled commercial locksmith to handle your security. Commercial locks are very different from residential ones; they need to be built stronger, not just for security reasons, but also because the doors on businesses are subject to a lot more wear and tear. After all, the doors on most homes only get used a few times a day, but at a business, hundreds or thousands of people could walk through the door on any given day! 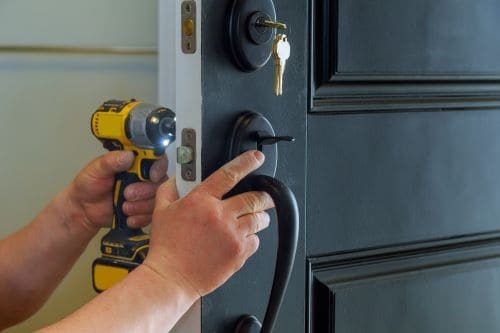 You’ll want a locksmith that specializes in commercial locks, and one that is adept at installing deadbolts and working with automatic doors and that is capable of ensuring your doors are compliant with the Americans with Disabilities Act (ADA). Of course, you’re looking for a complete lock and key service, and that means you’re not just thinking about your home and business. You’re thinking about your car or truck as well. Whether it’s a commercial vehicle or a personal one, chances are you’ll need a locksmith for it at some point. Everyone’s had to deal with the inconvenience of being locked out of a car, and everyone has dealt with the aggravation of losing their car keys. If the key and lock service you’ve found is truly complete, they’ll be able to help you in any scenario. If you need to get into your locked car, they will be able to do it. If you need a brand-new key made for your ignition, they’ll be able to do that too. They’ll even be able to repair or replace damaged locks in your car or truck doors. In addition to the broad spectrum of services for homes, businesses, and vehicles, a complete lock and key service will also have an eye toward modern technology. Locks these days can be vastly more complex than the mechanical tumbler locks most doors still utilize. There are electronic door locks—some of which even sport a Wi-Fi connection—that have been designed to automate the whole process of entering a building. In many cases, you’ll simply need to punch in a code to open the lock. However, there are also biometric locks you can access with a simple fingerprint and of course locks you can open simply by having the key in your pocket. Technology is advancing all the time and it’s critical that your security advances along with it. It’s extremely important to look for a lock and key service that is up to date on the latest technology. They’ll be able to assist you should you wish to install or access locks that make use of the advanced technology that is now found in buildings everywhere. Choosing the right key and lock company is every bit as important as selecting the right auto mechanic, plumber, or electrician. That’s why you want a company that offers many different services—commercial, residential, and automotive—but it’s not enough to simply look for talent. After all, the safety and security of your home, workplace, and automobile are all entrusted to your locksmith. That’s why it’s crucial to do a little homework and vet any key and lock company you are considering. You’ll want to analyze their commitment to security. Find out if previous customers have been satisfied. Learn if the company runs background checks on their employees. See if the company is a member of important organizations such as the Associated Locksmiths of America (ALOA). These memberships are important when checking the credibility of a company. You’ll also want to find out how long a company has been in business. Often, if a key and lock business has been around for a long time, it can be a hint they’re doing something right. Harry’s Locksmith provides complete key and lock services that meet all these requirements in the Vancouver, Washington area. In business since 1949, we keep up with the latest security technology and are an excellent choice for your home, business, and vehicle needs.